Long anticipated Denon AH-D7200 met its’ release date in January. The Japanese manufacturer focused on adding superb new features to its’ flagship headphone to deliver the unrivaled quality. Denon AH-D7200 Wins Best Headphone of the Year 2017-18 Award by EISA. Denon AH-D7200 headphone features an over-ear, closed-back design with the high-fidelity touches would leave even the strictest audiophiles speechless. We used the best of our time to play around with this gorgeous pair of headphones to get introduced with its features, design, and, more importantly, the sound performance. Whether are you springing for a new model of high-fidelity headphones or not, Denon AH-D7200 review will change the way you see this kind of headphones. High-Fidelity headphones, usually, don’t sport additional features such as Bluetooth, ANC, and others. That being said, AH-D7200 is equipped with features crucial for great musical performance. Check them out. Closed-back and open-back design are constantly in the competition. While some prefer the spacious sound with more clarity, a lot of people prefer keeping it personal between them and music they are listening to. Closed-back headphones may not sound as loud. However, the superb sound isolation is guaranteed. The large ear cups make the sound isolation possible. They are ideal for music monitoring where the need for the quiet environment is essential. Additionally, being closed-back, no one will be bothered by the echoing sound of your headphones, outside of them. Then again, these headphones are not quite for the outside use. The larger size of the driver is not always better. However, the 50mm drivers engineered with the FreeEdge driver diaphragm, the user can dive into the world of endlessly precise and vibrant audio performance. The drivers are made out of a nano-fiber material for the extended accuracy when used. For all of those who are looking for a great soundstage with discreet, yet dynamic and punchy lows, it is freshening to know that Denon AH-D7200 is absolutely free of distortions and other harmonic interruptions. In fact, Denon has handled this pair of headphones as a separate unit of speakers, which create high-fidelity, surrounding, and deep sound, personalized for your needs. More about that later. Although Denon AH-D7200 isn’t equipped with a 3.5mm adapter, the copper 6.3mm plug cable is detachable. In case this one breaks, the user will be thrilled to replace it without a sweat. Furthermore, Denon lets the users explore the connection options by attaching other types of cables as well. That being said, the connection is strong and steady. The features of Denon AH is endlessly innovative, we give it a well-deserved 5, hoping this grade will be justified in the following sections. 5/5. It is evident that AH-D7200 is a gorgeous pair of headphones. However, it doesn’t hurt to mention the components that make them as beautiful as they truly are. 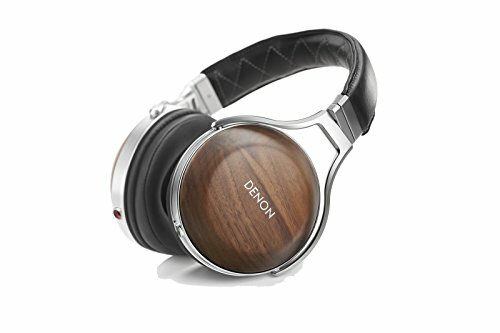 The ear cups of Denon AH-D7200 are made of 100% natural walnut. It is a more secure protection for the drivers, preventing the magnetic resonance and radiation. Additionally, they effortlessly eliminate the vibrations, moreover being self-damping. A sturdy ear cup builds such as D7200 has is essential for a large pair of headphones. They are better at reproducing the sound and channeling it towards the headphones in the process. If we talked about Denon AH-D7200 wearing comfort we wouldn’t know where to stop. Given that each one of us is unique, we deeply appreciate the click-stops which help us adjust the headphone size to our liking. This avoids placing the headphones uncomfortable and further miss all the enjoyable experience that wearing them brings. Furthermore, the headphones will guide you in restoring your wearing comfort zone when someone else wears them. The headphones are incredibly sturdy and durable, thanks to the die-cast aluminum construction. They fit excellently and feel even better. It is important to note that the soft leather ear-pads in combination with memory foam let the headphones breathe, preventing the heat and sweating which are two common problems when it comes to high-fidelity headphones. If you thought that the outside of the headphones is left unprotected, you are wrong. Denon AH-D7200 headband is covered with the gentle, luxurious, sheepskin leather. When we put together all the components together, this results in endless comfort. Additionally, the leather cover protects the material from breaking. Too much abuse certainly leads towards the damage of the headphones, and given the premium price, we wouldn’t be too rough on Denon flagship headphones. Worth mentioning is as well, that the headphones swivel with ease. This news will be liked by DJs who are looking for the high-end pair of headphones to assist them on music festivals. The headphones are quite heavy because of the 50mm drivers. However, like we pointed out above, the headphones are purely dedicated to the home, studio, or another professional purpose. The package lacks a cover bag, except the equipment for cleaning headphones. We are satisfied with the originality of design. Wooden ear cups give a solid protection to the ears, aside from looking professional and stylish. They are durable and comfortable, meant to be used for extended amounts of time. Given that the headphones lack some mainstream features, in this section, we will focus on headphones performance in terms of sound quality. We won’t be wrong to say that these headphones let you dive into the completely new world of music and discover it from the beginning in an innovative and original way. Let’s see what they are packed up with. Like mentioned before, AH-D7200 is a superiorly constructed headphone. It is not a secret that these headphones sound as good as they look. The already mentioned 50mm drivers hold their place inside, with good protection from the dangerous resonance, they deliver a punchy bass, which feels very tremendous and powerful. The output they give is rather similar to surround speakers than a pair of headphones. If you get a chance to test the headphones the way we did, you will agree that they are far more responsive than the surrounding competition. As of now, they are one of our favorite pairs of headphones among the high-fidelity pairs. When we tackle the rest of the soundstage, we are introduced to the prominent and warm mids. The voices are a bit over-attaching, but nothing the listener should be worried about. The frequency range is wide enough to support either loud and discreet sound, which will be unrivaled. The highs of the soundstage are where these headphones truly shine. Listening to the different genres we found the high accuracy and detail in the audio output. The sound glides through the soundstage and feels very smooth and comfortable to the ears. The last but not least the most important thing is the balance between the bass and the highs. Everything sounds extremely accurate and detailed. All in all, the headphones are packed up in a firm package, two pillars of stellar audio and firm build. We can’t help but discuss the value of the headphones. There is certainly the competition which sounds similar, yet ranges cheaper. However, the headphones will not sound better or the same. The headphones are fairly expensive, and thus, limited to a tiny market, but the market of professionals. These headphones are not to be juiced with smartphones. Instead, being the 6.3mm plug headphones, they intend towards the largest music studios, DJ decks, and general stereos with the mentioned adapter. It is great if you can set away from the budget for these extremely powerful headphones, but keep in mind that they are intended for the very professionals of the audio world. Regardless of being a headphone with a bold attitude, many virtues and features, Denon AH-D7200, unfortunately, holds some flaws. In the end of the day, Denon AH-D7200 is the world-merging pair of headphones. We haven’t seen this rhythmic and powerful performance on these headphones. If you are planning to craft music, these high-fidelity headphones are a great companion. Denon AH-D7200 is a flagship over-ear, closed-back headphone intended for the high-fidelity headphones. The headphones are welcome guests on the best equipped audio studios. Aside from being wonderful, AH-D7200 sports the latest FreeEdge driver technology. It results in outstanding sound performance, punchy bass and detailed soundstage. The design is also worth praising. They have wooden ear cups that give the stylish looks. Headphones are capable of swiveling, they are comfortable and durable, thanks to the sheepskin leather that protects the headphones from damage. That being said, they are a great investment for professional musicians.